40 years of helping San Luis Obispo make the best health insurance decisions. We’ve been reflecting recently on the privilege of serving the Central Coast since 1988. One thing that we’ve discussed is that we’re just as committed as ever to helping those we serve get the coverage they need at a cost they can afford, and to outstanding customer service (just ask Dave Ramsey). In view of all this, it seemed good to us to ‘get back to the basics,’ and remind ourselves—and you!—about what it is that keeps us going everyday. Because of our commitment to our mission and core values, we’ve been able to serve you for 40 years. And because of that same commitment, we know that our future be just as bright as our past has been. 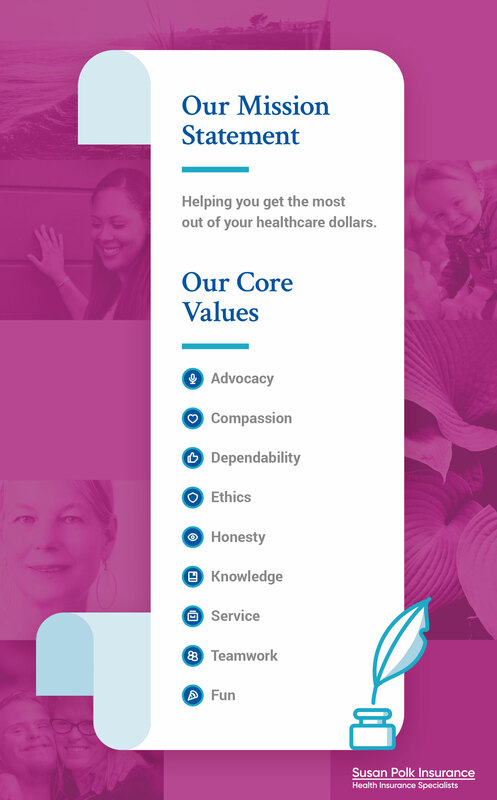 The mission of Susan Polk Insurance is to help you get the most out of your healthcare dollars. Have Questions about Health Insurance? Schedule a FREE Consultation Today.